In 1505, at the age of 53, Leonardo recounted his earliest childhood memory of a bird coming to him in his cradle. Throughout his life, he pursued the dream of flying. Although he was the first person to scientifically investigate flight, he was by no means the first or only person to think seriously about the problem. Roger Bacon, the 13th century philosopher whose work Leonardo greatly admired, described “a flying machine in the middle of which a man could be seated and make an engine turn to activate artificial wings that would beat the air like those of a bird”. During Leonardo’s own lifetime, Giovanni Battista Danti was said to have carried out trial flights over lake Trasimeno and eventually killed himself by crashing into the roof of a church. 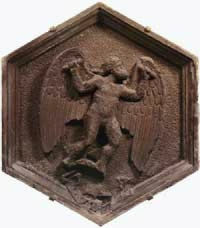 It is perhaps fitting that a 14th century relief sculpture on the base of Giotto’s bell-tower in Florence representing man’s creative aspirations shows the figure of Daedulus with open wings. Deadulus, the legendary Greek flyer, also died in the attempt. In the 15th century, people still believed that flight could be achieved by imitating birds. 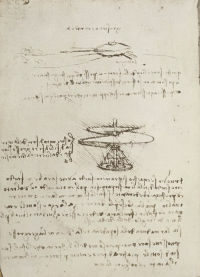 Leonardo’s designs for flying machines were based on the conviction that the principles used by nature in its flying creatures could be imitated and reproduced by man. He cites the kite as a model to imitate and refers to his flying machine as a “bird”. Virtually all the flying machines designed by Leonardo before 1500 are ornithopters, which have flexible wings like a bird. He concentrated on designing mechanical systems that would harness the physical power of the pilot to sustain both man and machine in flight. While his machines are powerful in appearance, they lack the sufficient power required for propulsion and are far too heavy to fly. Paris Manuscript B Fol 74v illustrates a mechanism operated by a pilot who is in a horizontal position in the manner of a bird, recreated as a model in the image on the left. The pilot powers and controls the beating of the wings with his feet by pushing on pedals that are attached to the wings by a complex system of cables. The wings beat up and down and inwards in a sort of rotatory movement that imitates the flight of birds. On the reverse of the same sheet, Leonardo illustrated a design for a wing that would flex and beat like a bird’s wing. It was made of cane skeletons, leather tendons, muscular springs and membranes of starched silk and “fustian, on which will be glued feathers”. Leonardo also designed ”standing” ornithopters. The machine on Manuscript B Fol 80r is a bowl-shaped airship, within which the pilot bends and unbends to pump a piston with his head while turning windlasses with his arms to operate four flapping wings 24 metres long. The machine has a retractable under-carriage and entry ladder. Its considerable weight did not deter Leonardo, who seems to have thought he was close to success. He even contemplated a test flight! Perhaps his awareness of the dangers deterred him. He recommended to others that the machine be tried over a lake, with inflated wineskins attached to the aviator to prevent him drowning. Leonardo rarely deviated from the principle of beating wings in his inventions. One exception is the design on Manuscript B Fol 83v for an “aerial screw”, which has led to false claim that he invented the helicopter. Leonardo’s invention is based on a helical screw 10 meters in diameter and not rotary blades. But the drawing does express the scientific principle that when the air is compressed it has density, which was to find its application much later in the propeller or helicopter. 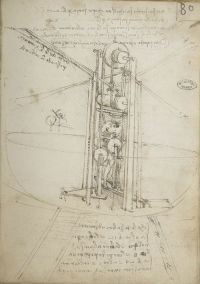 Leonardo’s machine was supposed to lift off when rotated, but one might well ask how the force required to achieve sufficient rotating speed would be obtained. It is likely that his device was not for manner flight but was intended for a public spectacle. Nonetheless, it’s nice to think that Leonardo’s drawing may have inspired Igor Sikorsky’s invention of the first stable, single rotor controllable helicopter, having been reputedly shown Leonardo’s drawing by his mother. One of his wing designs was used in a hang glider, made for the television programme “Leonardo’s Dream Machines” (Channel 4, UK) and generated more than enough lift to carry an aviator over a considerable distance. During the early 1890s, Lilienthal achieved the first sustained stable flight in a glider. In his machine the pilot throws his hanging torso and legs in the direction in which he wants to travel, thus shifting the centre of gravity and with it the centre of pressure. According to Leonardo’s principle the upper body controls the shift. This is a serious error, which would have led to instability and eventually the pilot and machine toppling over! Leonardo’s study of flight and innovative inventions had no significant direct impact on early flying machines, simply because his work in the field was little known before it was published in the early 20th century. Earlier publications of his manuscripts either omitted his work on aeronautics altogether, or did not take it seriously. Hureau de Villeneuve’s article in L’Aéronaute in 1874 was the first publication that properly established Leonardo as the first to scientifically investigate flight. Nonetheless, Leonardo’s observations on the flight of birds are a valuable contribution. His study led to the observation that “as much pressure is exerted by the object against the air as by the air against the body”. This predates Newton’s so-called third law of motion, which states that every action gives rise to a reaction of equal strength in the opposite direction, by almost two hundred years.